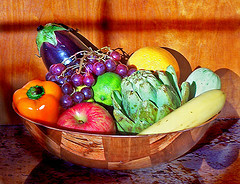 Home » Blogs » Mark Virkler's blog » It Only Takes 10 Days for Good Nutrition to Improve Your Health! For Daniel, the results were visible in 10 days (Dan. 1:12-14). Ten days on fruits, veggies and water and his skin glowed (Dan. 1:15)! It is amazing that I could improve my health visibly that much in just 10 days. How is this so? Your body is constantly recreating itself from the inside out, on a moment by moment basis, so awesome nutrition gives your body the tools it needs to create awesome healthy cells. Make food your medicine. Here is a powerful TEDX Testimony of the amazing healing power of the Genesis and Daniel Diet. So What Is Good Nutrition? Well, Daniel chose not to defile his body with the King's rich food. We could begin by asking, “What is the king’s rich food that defiles our bodies?” Obviously we don’t want to defile the temple that God lives in (1 Cor. 6:19). The food that Daniel chose to eat was vegetables (Dan. 1:16, 17). These, he said, would not defile his body (Dan. 1:8). Good nutrition would include organically grown fruits, vegetables and water and the seeds should be “Heirloom Seeds” if at all possible, rather than manmade GMO seeds. The food should be as non-processed by man as possible, or in other words as close to the way God created it as possible. Cold processing is better than heat processing, as heat destroys the enzymes which your body needs to digest the food and transfer the nutrition into your body. They say it is good to eat lots of raw green unprocessed vegetables each day. Well, we have agreed with that, but not found an easy or delicious way to do that until NOW. We have just discovered great tasting healthy green drinks and protein drinks which we are consuming for two of our meals each day. We pour into these great tasting drinks the following products: Greens First (Berry or Original Mint). These are coupled with a Boost (Dutch Chocolate or French Vanilla). I (Mark) like the Original mint with Dutch chocolate boast. Patti likes the Berry with the French Vanilla boast. We always add in Bone Broth Protein Powder. I throw in chocolate and Patti throws in Vanilla. Another protein powder which Patti likes is Spring of Life Natural Vanilla plant based protein powder. Feel free to try either of these and use the one you like best. Extras we throw in to make it even healthier are one scoop of Patriot Power, Sports Formula, Fulvic Ionic Minerals, B12 and HerbaGreen Tea. We muscle test very strong for all of these products. These all shake up easily without the need of a blender and I can easily pre-mix these in baggies (Only the powders) and take them with me for easy energy drinks in airports, hotels and at seminars. Did I mention these taste DELICIOUS and I feel instant energy within minutes after consuming this drink?! Where do we go to get recipes for DELICIOUS smoothie, healthy drinks? When you order any product from BioTrust, they send you a free recipe book of awesome, delicious drinks to make up in the blender. These smoothies are our standard lunch, unless we switch it off with the Budwig diet, which is a wonderful, tasty, anti-cancer lunch. So two absolutely delicious, healthy, low calorie liquid meals every day! Note: We are currently tending to skip breakfast, and have our breakfast drink at lunchtime, along with some nuts (Pecans, Cashews and Almonds) which we prepare this way, making them more delicious and more easily digestible. We get healthy, delicious meal ideas from the Beyond Diet website. To make sure we fully digest it all we are using a great digestive enzyme. We have found through "muscle testing" (which is a test we can easily do on each other) that all products created by BioTRUST are extremely beneficial to our bodies as are all products by R-Garden (R-Garden runs 50% sales every month!). Digestion takes place in both our stomachs and small intestines. Through muscle testing you can discover what you need with each size meal. Some folks may discover (i.e. through muscle testing) that they also need to supplement with HCI as acid decreases in your stomach as you age. In addition, blood type "A" people tend to not have enough acid in their stomachs. For these reasons, I take 1-4 capsules of HCI Betaine with anything I eat. The amount taken depends on the size of the meal and if meat is included in the meal. If you take too much, you will have a burning sensation in your stomach, so cut back. Never take HCI Betaine without putting food in your stomach. Another great digestive aid is Beano, which is likely available in your grocery store. We have found value in drinking a few onzes of Aloe Vera Juice morning and evening as it is so healing to our intensines. We mix our aloe 50/50 with colodial silver. Bragg Apple Cider Vinegar can be powerful in helping heal digestion. Mix two teaspoons with water and liquid stevia and drink it immediately before each meal. Make sure you use Bragg Apple Cider Vinegar as it is raw, unfiltered, unpasteurized, gluten free and organic. Here is an excellent article on 70+ Wonderful Uses of White Vinegar. Along with the above delicious smoothies twice a day, we add in a crunchy item which is Coco Lite whole wheat pop cake (available here) at only 20 calories per pop cake. These don't have much flavor but they satisfy the need for "crunch"! As you probably know, there are many studies proving Green Tea is extremely healthy for your body. Herbal Green Tea is a liquid which you can put into a cup of cold or hot water and have an instant, great tasting cup of green tea which is so potent, they advertise it as being equivalent to 15 normal cups of green tea! So a couple of these each day is the equivalent of 30 cups of green tea! For snacks we enjoy Kind Peanut Butter Dark Chocolate bars. We drink about 6 glasses of water each day in addition to the green tea. We highly recommend you explore in depth the website www.BeyondDiet.com. Vitamin D3 is a must and can be ordered from any reputable natural health company. Also absolutely necessary to good health is adequate amounts of Omega 3 fatty acids. Use muscle testing to find a product that supplies your body with what it needs. Your body makes up to three million red blood cells each second, or 260 billion for the day. In 10 days on the Genesis diet (i.e., a vegetarian diet), he is able to take everyone off their high blood pressure medication, as well as everyone who is on insulin from adult onset diabetes. This is done under his care as a physician. We do not recommend that you stop taking any medication without the oversight of your personal physician. Here is a link to John McDougall's Health and Medical Center. Dr. Dean Ornish, Clinical Professor of Medicine at the University of California, San Francisco, "tracked thirty men with low-risk prostate cancer who decided against traditional medical treatments like surgery and radiation. Instead, the men went through three months of comprehensive lifestyle changes in order to address causes. They altered their diets, established a consistent exercise regime, and applied stress management techniques for an hour each day. After three months, the men had changes in activity in about five hundred genes, including increasing the activity in forty-eight disease-preventing genes and turning off activity in 453 disease-promoting genes involved in prostate and breast cancers." One group of chronically ill patients was given 3 healthy meals per day while a control group of chronically ill patients ate their normal diets. Monthly healthcare costs were 31% lower for the following three months for the group which was eating 3 healthy meals per day. Like Daniel, we are getting healthier every day. Our current goal is to arrive at age 105 in vibrant health. And yes, we do exercise daily (bike riding together about 7 miles a day and 15 miles one day each week, plus stretching and strength-building exercises) and make it our goal to process emotional stress quickly so we do not have dis-ease in our souls, as that produces disease in the body. We are passionate that we live in God's abiding realities of faith, hope and love (1 Cor. 13:13) as well as maintain an attitude of thankfulness since ALL these are powerful healing agents for our bodies. Let’s all live long enough to fulfill our God-given destinies! Take Charge of Your Health - This is Dr. Mark and Dr. Patti's primary foundational training on health care, and should be read by everyone as it provides an outstanding overview of the various factors that need to be addressed to achieve overall health. Healthier Today Than Yesterday - This eBook was written at age 60, and is an excellent add-on to the truths in the above book. CLU College Course "Take Charge of Your Health" - Taking this course will force you to internalize and assimilate the truths of the book Eden's Health Plan - Go Natural. It is what you assimilate that changes and improves the quality of your life. Take the time to master an understanding of health care. The life you save will be yours or one of your loved ones. Go Deeper - Get Healthy! Check out this entire blog series on Vibrant Health! - Miracles PLUS Gifts of Healings. Working through this series on health is ideal for both individuals and groups. The more we take responsibility for ourselves - spirit, soul and body - the healthier we become! Won't you join me in living to at least 100 in vibrant health?